For many years, GrubHub (GRUB) has long been an investors' favorite within an otherwise-hated food technology sector. More than any other food tech company, GrubHub has managed to continually post electrifying growth rates (albeit helped by M&A) while continually expanding its addressable market and slimming its loss profile. GrubHub's fall from grace, in my opinion, is a reflection of the stock's premium valuation (especially against other consumer technology stocks, which have re-rated negatively since the December pullback). That high valuation rests on the assumption of equally high growth - and if GrubHub fails to deliver that premium growth, the valuation must come down. Part of the problem isn't just anchored on growth, but on future profitability as well. GrubHub. The company's FY19 guidance range of $1.315-$1.415 billion represents 36% y/y growth over FY18 revenues of $1.007 billion, and while that represents a marked deceleration from 47% y/y growth in FY18, it's still above consensus forecasts of $1.34 billion (+33% y/y). Where investors took issue, however, was the light EBITDA guidance. The company's forecast of $235-$265 million in adjusted EBITDA falls far short of the $302.4 million that Wall Street was hoping for. In addition, it's essentially flat to the $233.7 million of adjusted EBITDA that GrubHub generated in FY18. For a company of GrubHub's scale, growth isn't the only factor to look at anymore: at a >$1 billion revenue run rate, GrubHub also has to demonstrate its ability to scale profitably. The company currently has a market cap of $7.61 billion and a net debt position of $116 million - indicating an enterprise value of $7.73 billion. This represents a multiple of 31x EV/FY19 EBITDA against the midpoint of next year's low-growth EBITDA forecast range - which makes GrubHub seem incredibly overvalued. Investors may also be reacting negatively to the news of an impending Postmates IPO. Long a popular unicorn that has competed against GrubHub for loyal users, the publicity of the Postmates IPO brings to mind a frequent topic for GrubHub bears: rampant competition. The on-demand food delivery space has no shortage of contenders, including UberEats. GrubHub's growth so far has been strongly fueled by M&A, but with the company already in a net debt position and forecasting limited EBITDA growth, it can't continue to fuel acquisition-driven growth forever. 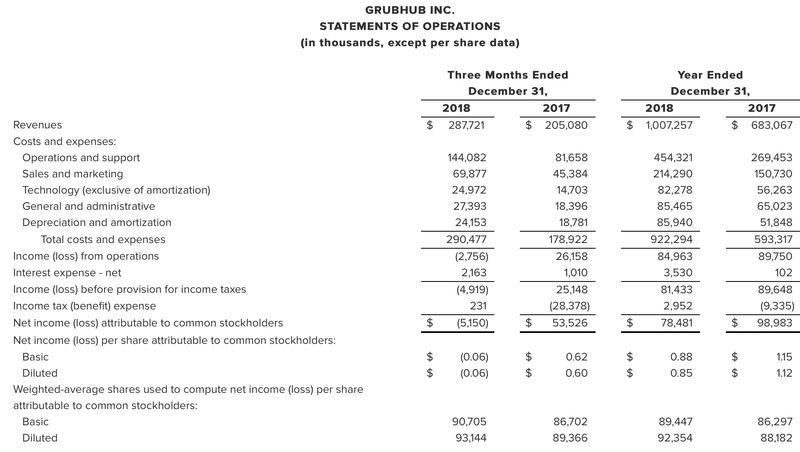 Though I was bullish on GrubHub when it was smashing Wall Street estimates on a regular basis and growing at >50% y/y, GrubHub's most recent results give me pause on the company's outsized valuation. In my view, now would be a good time to lock in gains. Revenues grew 40% y/y to $287.7 million, falling one point short of Wall Street's expectations of $290.0 million (+41% y/y). Perhaps even worse, however, is the fact that GrubHub's revenue growth decelerated sharply - by twelve points - relative to last quarter's growth pace of 52% y/y. In particular, note that gross food sales slowed down to +21% y/y growth, down from 23% y/y organic growth last quarter. On the bright side, however, GrubHub increased its active diner base to 17.7 million, or an increase of 1.1 million net diners in the quarter - a new record for the company. It remains to be seen, however, if GrubHub can convert these new diners into regular users to drive food sales. This dramatic diner, DAG and GFS growth is a direct result of our fourth quarter investments in marketing and new delivery markets. We spent significantly more on advertising in the fourth quarter of 2018 than we ever have before." Sales and marketing costs exploded 54% y/y to $69.9 million, eating up 24.2% of GrubHub's revenues - 210bps higher than 22.1% in the year-ago quarter. Primarily as a result of this boost in marketing spend, GrubHub's operating profits slumped into a loss of -$2.8 million this quarter, representing a -1% GAAP operating margin - versus a positive operating margin of 12.8% in the year-ago quarter. GrubHub's pro forma EPS of $0.19 also widely missed Wall Street's mark of $0.28. In addition, adjusted EBITDA - GrubHub's primary metric for defining profitability - took a tumble as well. The company's adjusted EBITDA sank -26% y/y to $42.1 million, representing an EBITDA margin of 14.6% - substantially lower than 27.8% in the year-ago quarter. Wall Street, by contrast, was expecting $47.2 million in EBITDA, or a 16.4% margin. Cracks are beginning to show in the GrubHub story. Once we move past a year where acquisitions drove much of GrubHub's top-line growth, the company's revenue numbers will start becoming more unimpressive. At the same time, GrubHub is spending heavily in order to organically attract new diners - and while this is certainly driving a bump in "grubs", it's sinking GrubHub's operating margins. With the weakness seen in this quarter's results, GrubHub will likely undergo a multi-quarter correction and vacillate between gains and losses until the company can show better results. In my view, it's best to stay on the sidelines for now.